You want to apply for visa of Spain give us a miscall on 022-66209999. Consulate : Maker Chambers IV, 7th Floor, Nariman Point, Mumbai 400021 Tel. : 2288 0219. VFS : Aurum House, Dadyseth Lane, Lane Next To Babulnath Temple Entrance, Babulnath, Mumbai – 400 007. Passport valid for more than 6 months (1 set of copies of full passport). 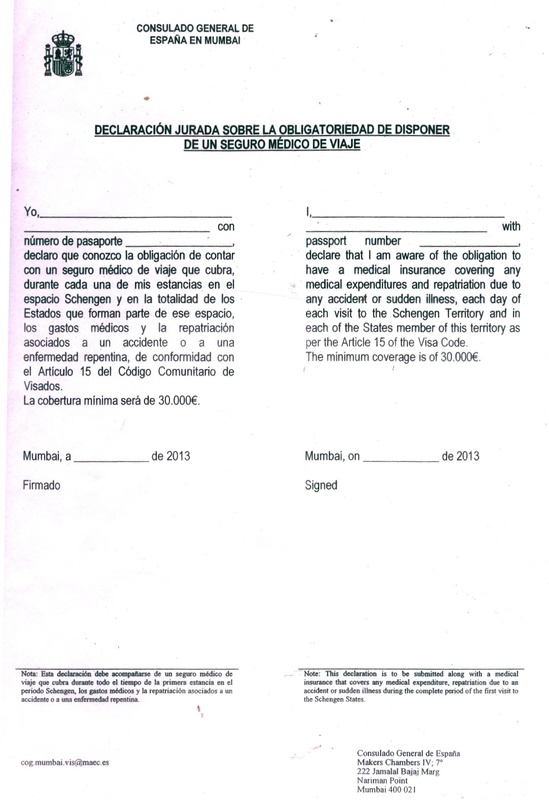 One visa forms with two signatures, should be print back to back and to be filled with blue ink pen. 2 Recent Photographs 35mm x 45mm with face 80% white background & without border (Photographs should not be old for more than 6 months). Covering Letter with employee details like date of joining, current CTC and designation. Bank Statement with Original Bank Seal for the last 6 months with minimum balance of Rs. 75,000/-. Income tax papers for the last 3 years. Medical Policy should be valid for more 15 days after their arrival in India. All the documents should show travel date after 8 to 10 days. Submission Time : 10:30 AM to 02:00 AM. Collection Time : 05:00 AM to 06:00 PM.